This 4 layered Mexican dip is one of the easiest to make, but don’t let that fool you. The flavor is fantastic. I first got the recipe from my sister in law. I’ve made this dip with both full fat cream cheese and meat chili, as well as fat free, or reduced fat cream cheese and vegetarian chili. All work well. The main thing to make sure is that the cheese on the top is regular cheddar cheese, or it won’t melt well. Bring it to your favorite party and I guarantee you that the dish will be empty before you know it. 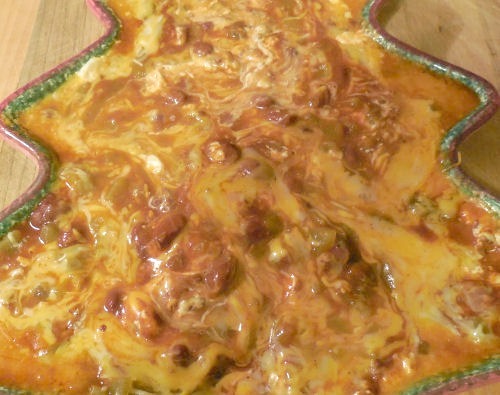 The dip needs just four ingredients: shredded Mexican cheese, cream cheese (use the full fat. I’ve tried it with reduced fat and low fat and it is not as easy to dip.) 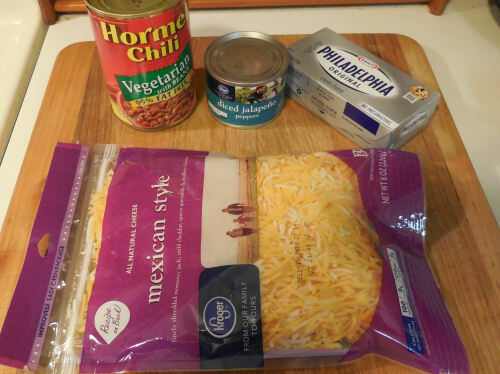 canned chili – I used vegetarian but any type will do, and a small can of diced jalpeno chilis. (hot or mild – you choose the heat). 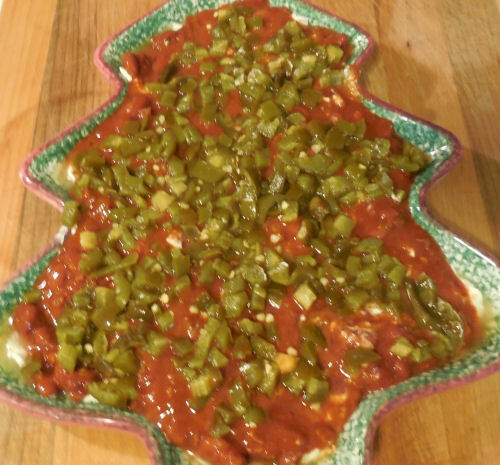 I chose a Christmas tree shaped dish for the dip. 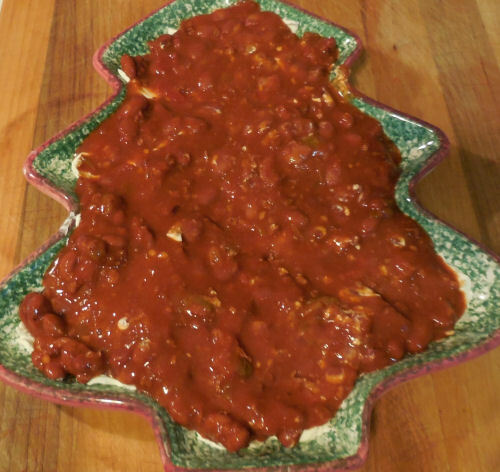 Note that while it is very festive, it’s not as easy to heat the in microwave because of the irregular shape, so I had to stir it from time to time. A normal round dish does not need this step. 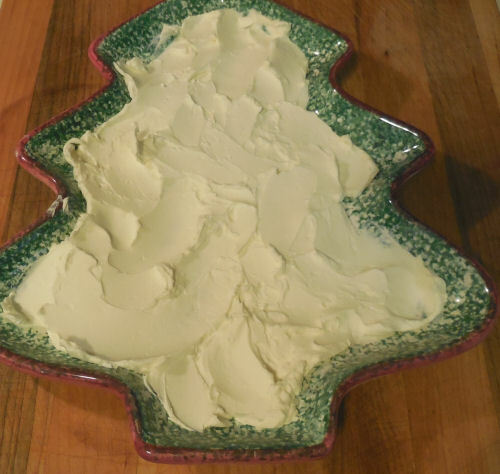 Spread a layer of cream cheese in the bottom of the dish. Next, spread over the chili mix being sure to cover the cream cheese well. Spread a thin layer of the diced chili peppers. Be sure to cover this layer well since the chilis are hot, so they need to be spread thinly. 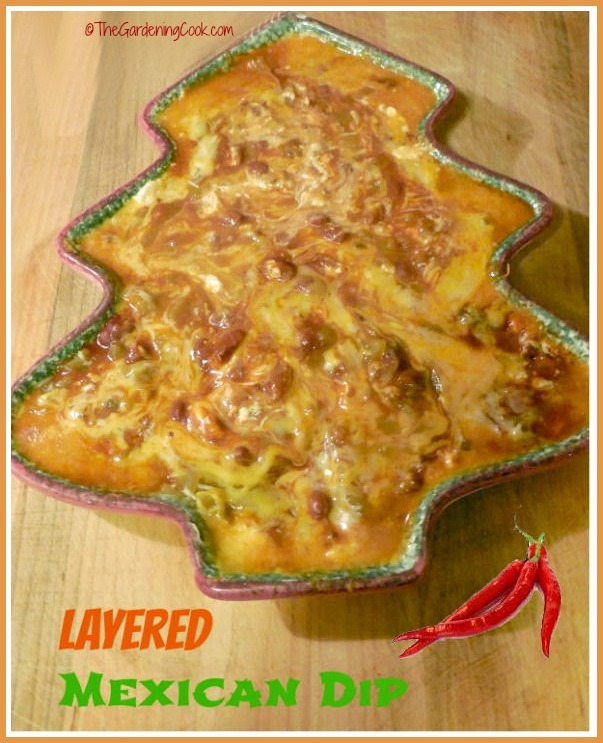 Top with a layer of Mexican cheese. Cover with saran wrap and cook in the microwave for about 3 minutes. If the dish is oddly shaped like mine was, stir the mix half way through. Serve with a bowl of your favorite taco chips and stand back while it gets demolished! I have never taken it to a party when it wasn’t gone in the first 20 minutes! 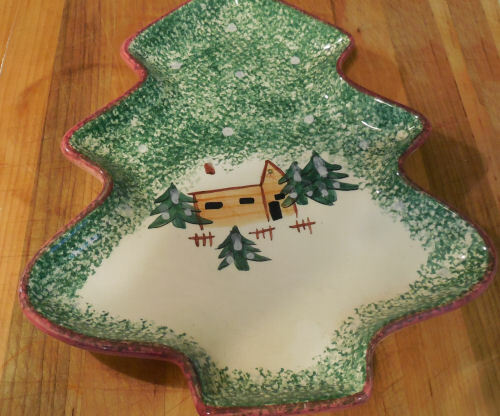 If you don’t have a Christmas tree platter, our affiliate Amazon has one by Spode which is just the right size. See the details here. (affiliate link). 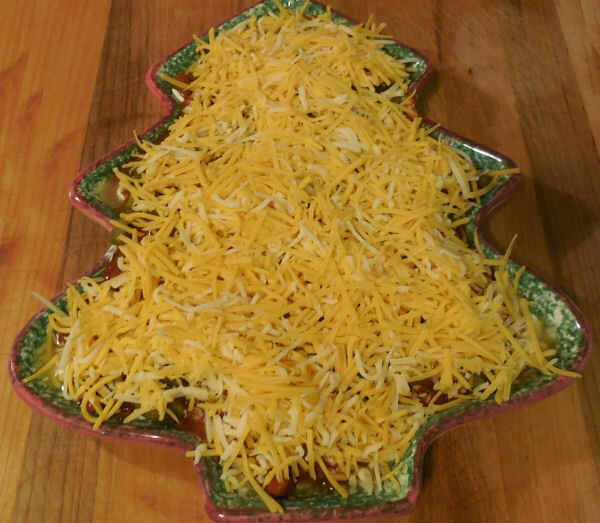 You can make this dip in any shape of serving dish but a festive one looks great on your party table! Cover the cream cheese with the canned chili, spreading well. Spoon the chilis in a thin layer over the top of the chili being sure to cover well. Top with the shredded cheese. You can use the whole bag or less to save calories. Serve with your favorite taco chips. I used Doritos Tortilla Scoops, since the dip is quite dense and they scoop better without breaking.